The weather is just dreadful so no gardening can be done, so its playtime. What fun. 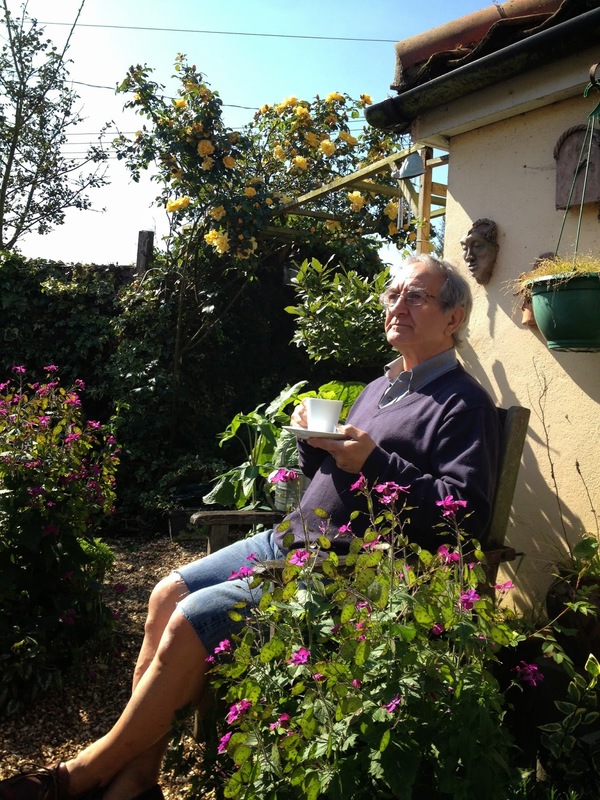 I told you about the Rowan-knit-along a few blogs ago, it is week 6 now and so far I have been keeping up to date. 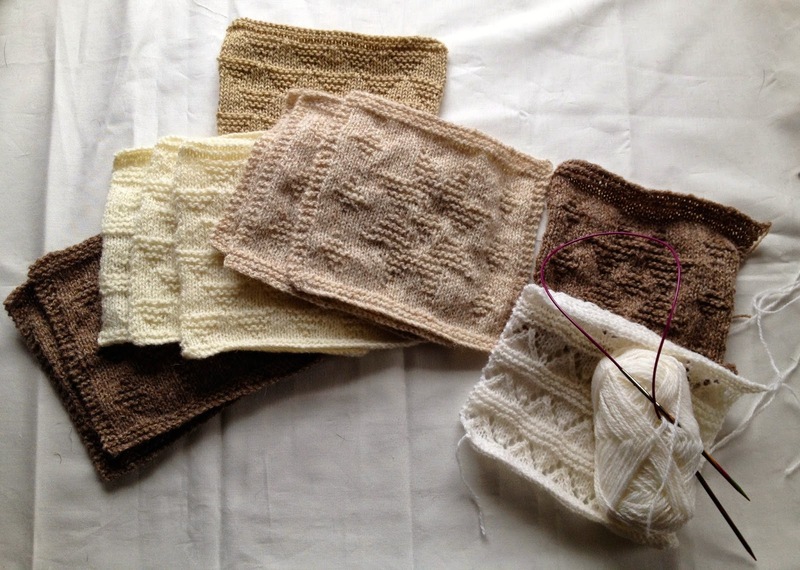 The patterns each week are free to download, and you knit 6 blocks each week, 3 in two different colours ways. Aren't they scrumptious, like a box of chocolates. I am on block 32 and I think there are 48 blocks in all, plus the border. We shall see, it is a Mystery Afghan. Talking of playing, I had some fun on the sewing machine as well with lot of scraps. These blocks look really complicated, but as you know I don't do complicated, and they really are not. 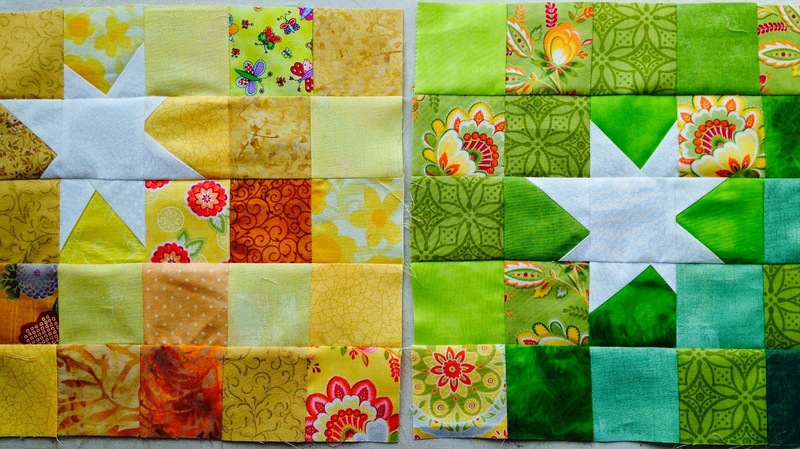 Just two basic 9 patch blocks, stitched together (face to face) and then cut in quarters. I want to do a big pile of them before they are sewn together, as it's scrappy. Watch this space. Back to knitting by the fire now. Nothing has been finished and I have not started anything new, so here is a little roundup of what the girls were working on at the Bee this week. 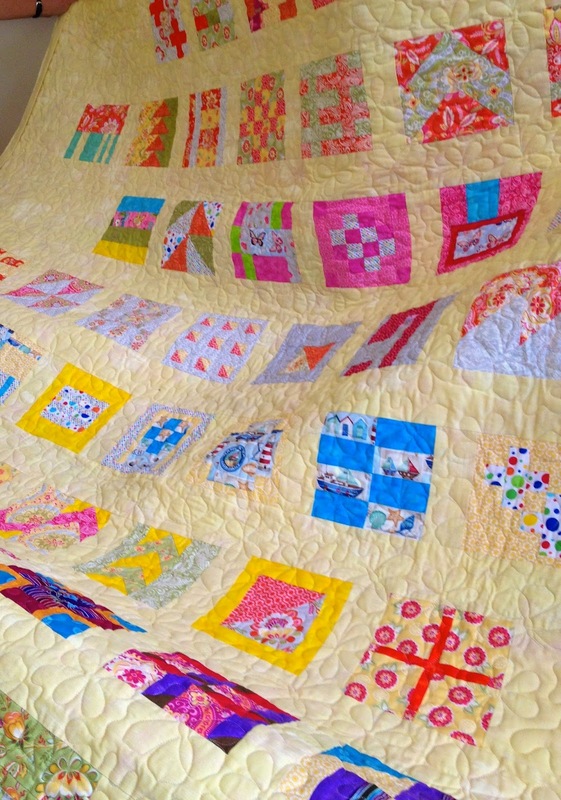 Ann has nearly finished her quilt- as- you- go quilt for her granddaughter. She said it took her a year to collect all the different fabrics. This design is called Fiona, and I think all of us have made it at one time or another. It looks so different each time some one makes it in their own colour combo. Jan had just got her quilt back from the long arm quilters and was busy sewing the binding down. The design is by Tula Pink from her book 100 design blocks. 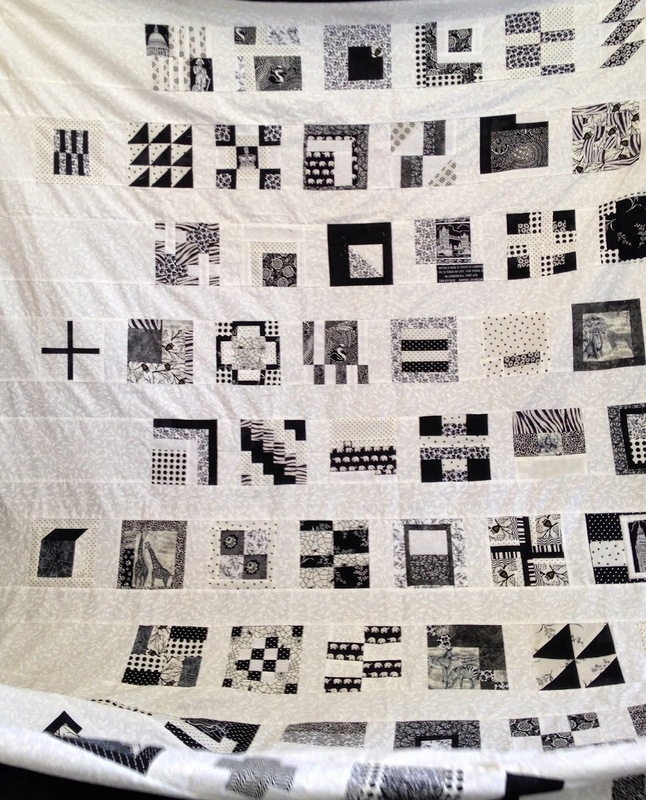 Jean's is another Tula Pink design but in monochrome, and is to be a wedding quilt. 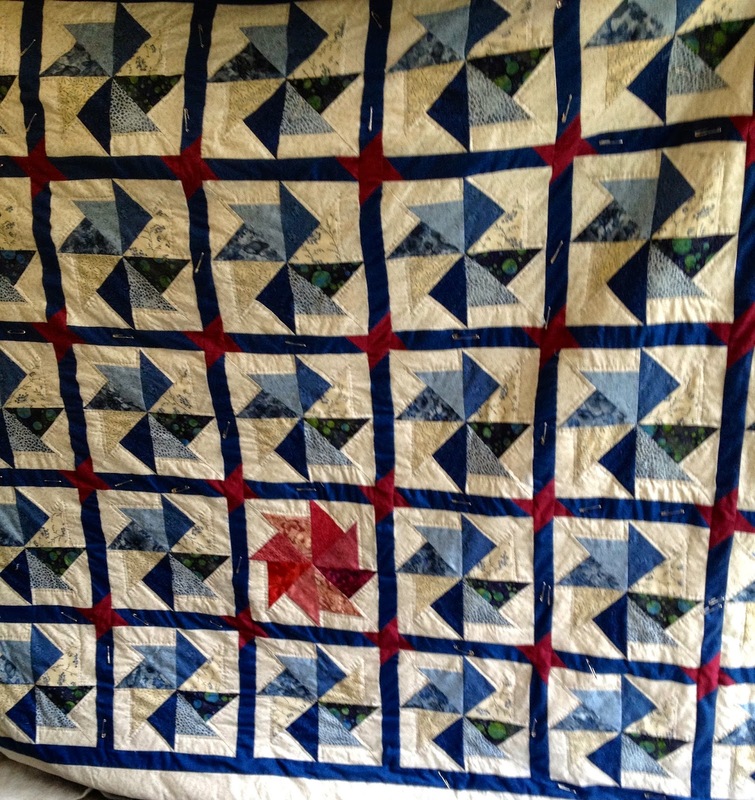 The lovely Maggie was hand quilting a pinwheel quilt for her grandson, I do like the rogue red block. These were all the photos I took, too much chatting and cake eating and having fun. Me, well I am still plodding- on hand quilting the Parsley and Time quilt but it is getting there and I am so pleased I decided to hand quilt it. The stitchery blocks are all puffed up really nicely. I have got to the borders, so not much more to do. It's not a nice day today so I might just get on with it. 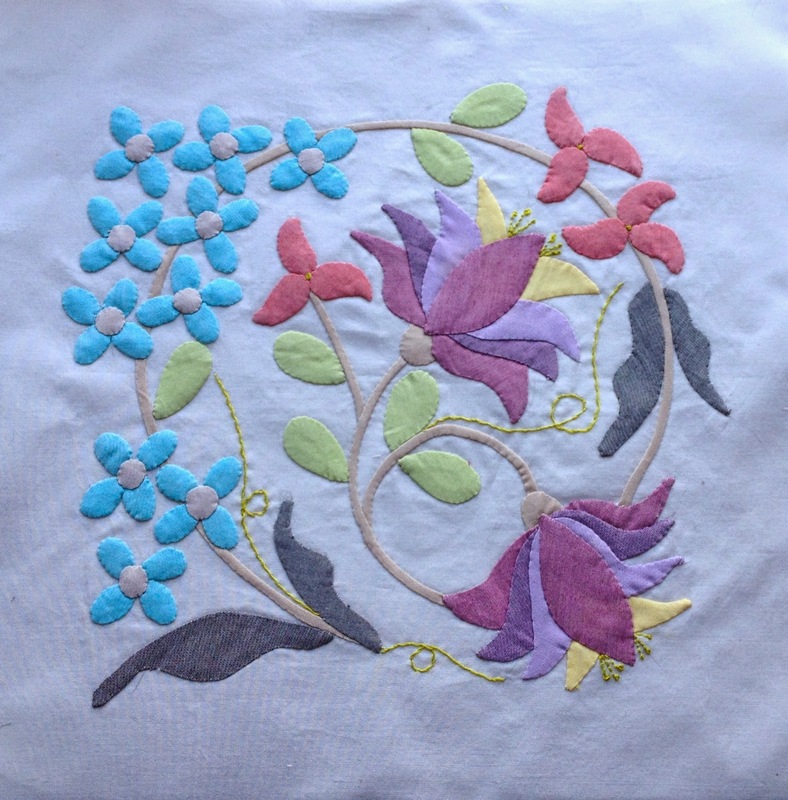 I have given my sewing fingers a little rest after the appliqué block for April. So a little knitting has been attempted. I heard Rowan has a Mystery Afghan Knit-a-long with free patterns, as I just love a mystery I had to give it a go. Here are the blocks so far, (this photo is a lot lot darker than the wool actually is) and I am knitting it in 4ply instead of worsted dk, so my Afghan will come up smaller. I might have to knit more squares. I spent a lovely day yesterday with Susie Yeats, who is the coordinator of the community quilt/ hanging, we (Saint Felix Frolic Quilting and Sewing Group) are making for the Southwold Festival. We got the first four rows of the quilt sew together, and I got a closer look at peoples blocks. Oh my! some of them are fantastic and all so different. On the home front I did manage to complete May's Alphabet blocks, still using only my stash and scrap bins. Next month we will be half way through the BOM, where does the time go? All Mays appliqué BOM pieces are cut out and I hope to start on that after I have made the binding for the community quilt all 400" or so..
Oh my, it has been a busy, busy week, and thankfully the wrist and thumb are holding up. Firstly I have caught up with April's Appliqué BOM. 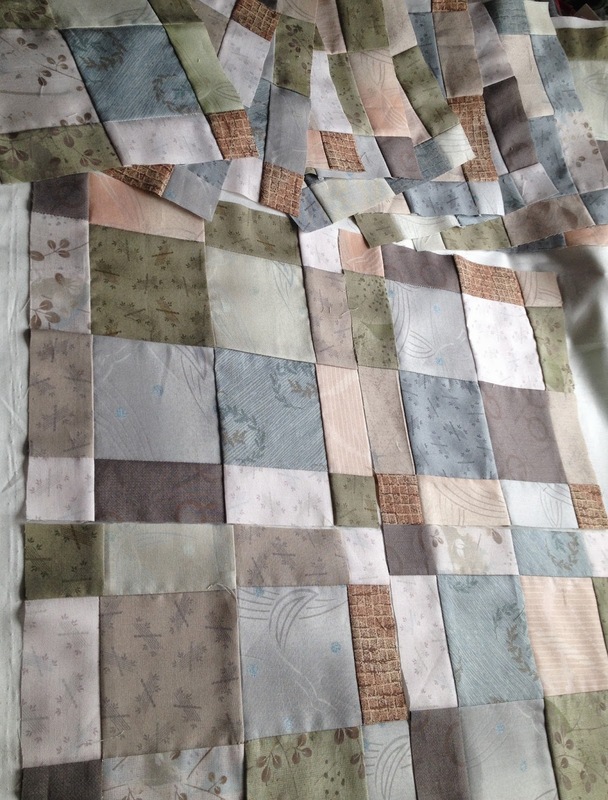 This BOM is designed by Deborah Kemball using the lovely Oakshott fabric. When I started this eight months ago it was so very hard, but I have to admit it is getting easer as the months go by, and I am actually looking forward to this months. Oops, not sure I should say that, better cross my fingers. The May blocks are made for the Siblings Together 2, and just have to be posted off to the Mama of the month Sue, who lives in Jersey. My next job after writing this blog. The first of the three May blocks for the Alphabet Quilt BOM is almost finished K L M for this month, which makes me laugh as these are my daughters initials. The Parsley and Time quilt is still being hand quilted, no photos as yet, as I want to get the middle finished first, though I am pleased it's "looking good." The week looks as if it is still going to be busy as I have to make another block for the Community Quilt by Thursday evening. My mojo is in overdrive Ha Ha..
Keep safe and keep stitching ...........Doti..